Hospitals are stretched because more people go to hospitals now, rather than to their doctor, at least in part because they can’t afford to do otherwise. More options for public communications mean that instead of a traditional emergency telephone call, people ring up anywhere for anything on their cell phone if they need help. Most services remain committed to taking the patient to the hospital. But a new emergency medical model is evolving, which takes the hospital to the patient. Consequently, emergency medical organizations must now build up technology and capability in their fleets, so that paramedics can do more for patients. And that creates a more complex environment in which the paramedics will work. What will the new model mean for patients? In a perfect world, there would be specialist doctors or general practitioners in every ambulance, but this is clearly not feasible. The current paramedics will need to ramp their skills in terms of the types of medical conditions that they will deal with. After triage, the goal is to give a patient the appropriate care as quickly as possible, to stabilize their condition, and increase their recovery and survival chances. Going to a hospital to treat an acute condition is just one treatment option. For example, let’s consider heart attack patients, whose survival chances are increased by intermediate care. To do this, you need highly trained paramedics, who can communicate in real time with hospital specialists. And you need technology that means the clinician in the back of an ambulance can connect to the cardiologist when he’s reviewing the script from the patient life pack, or to a triage doctor who can describe the treatment that will keep that particular patient alive. This is just one way that communication will influence the patient outcome and widen the treatment window. There are many examples that will potentially make the window wider. Left untreated beyond the first six minutes, a stroke victim typically loses two million neurons and seven miles of nerve tissue every 60 seconds. These patients need to get to the intermediate treatment point to give them more time. If you can widen that window so they don’t lose so much, follow up care is shorter and cheaper. How could we do that on the ambulance journey? We could give the hospital the forecast of medical condition information and time of arrival, to prepare them for what needs to happen. When we actually hit the door lock, the theater is already booked, medications are sorted, and everything that patient needs is ready on arrival. When delay is minimized, the cost is cut, and the patient outcomes are more likely to be successful. The Connected Clinician model that we are working toward allows us to connect multiple activities more securely. With everything operating across one mobility platform, it introduces a whole suite of new applications for paramedics. Eventually, instead of administering these apps, paramedics will work hands free as much as possible, so that they can focus directly on the core tasks essential to the individual patient journey. That will have significant impact on hospitals in the future. Estimates suggest it will move around 30% (the non-critical portion) of ambulance traffic from emergency departments to community practitioners. When that happens, hospitals can physically shrink and become more specialized to deal with critical conditions such as strokes and heart attacks. At a time when state health budgets are under stress, pressure to build more hospitals will be substantially reduced, and the cost of a new hospital – typically around $750 million – is predicted to drop to $400 million. Here are some Connected Clinician options that New South Wales Ambulance is currently pursuing. We are in the process of developing electronic patient record systems that will eventually support – and be supported by – paramedic input. We have resolved an internal security issue with the medication safes at the ambulance stations. We can now automatically track medications wirelessly, so neither patient nor staff is responsible for recording their use. This creates robust barriers to unauthorized access, and manages medication supply. Wearable, hands free communication, and automated monitoring of patient signs will mean that paramedics can focus on patient treatment (not communications) because vital information is transmitted to the right people automatically. Increasingly, paramedics are experiencing threats and assaults by drunk, abusive and violent members of the public. Duress monitoring can be built into paramedics’ shirts, so that pre-programmed biometric levels open the mic on a comms device, which then communicates (and records) what’s happening, to alert dispatch and initiate support. While these and other examples will further the Connected Clinician model, so far there is little evidence of automation for triage, treatment recommendations, or route planning. Certainly, if you are making a high speed dash, some of this is covered by existing procedures; dispatchers can identify the closest vehicle to the job. Even at that level, vehicle capability is immediately elevated by enabling fastest route to incident. Anything that can lessen the load of the paramedics means they can just attend to their patient, which is positive for patient outcomes. But so much more can be done. Eventually, what we now call artificial intelligence will be a regular feature of all business operations. By leveraging the Internet of Things, we can have seamless connections to multiple community medical providers or practitioners, who can advise, prescribe, monitor, and only direct emergency patients to an emergency department if absolutely necessary. If we look at what is already happening in consumer-level communications, we could ask Siri (or another ‘smart assistant’) to open a patient’s medical record. The paramedic is talking and Siri records all the information, populating the medical records and perhaps videoing what’s happening in the back of the ambulance. Now, instead of setting up connections, all the paramedic needs to do is talk, and provide care for the patient. The smart assistant is automatically recording the patient information and populating the patient medical records, managing the comms, videoing the situation – perhaps even offering recommendations. The paramedic might then say “Contact the cardiologists at Southern Hospital,” or “Inbound seven and a half minutes,” or “traffic heavy”. Some or all of those communications can be automatically sent as part of the integrated package. With LTE and the Internet of Things, officer training can occur dynamically, using virtual reality, augmented reality, and artificial intelligence. This will greatly extend the possibilities beyond the video and messaging currently used, over the ambulance Mobile Data Terminal. Some US ambulance services are currently looking at a future of driverless vehicles. Initially, it will be hard to establish trust, but eventually all traffic flows will be managed by a computer system. If you have, say 400 drivers, you might now only need 100 to keep the automatic driverless system on the road. That will make better use of a shrinking resource, as the others can be upskilled and redeployed as mobile paramedics, who are now solely responsible for clinician tasks. The automated communications platform is essential for this approach. Another traffic control solution is the green light card which provides a green light current through all intersections. Bus systems are doing that right now by delaying or advancing traffic light phase changes to speed up public transport; in Finland, for example, the bus authority is connected into the traffic authority as part of a Smart City initiative. Emergency service organizations can integrate with CAD dispatch systems to forecast emergency calls and provide ambulance pathways along a green light corridor. Currently still a work in progress, it also provides advantages from a worker health and safety perspective, by reducing driver stress and the risk of accidents. 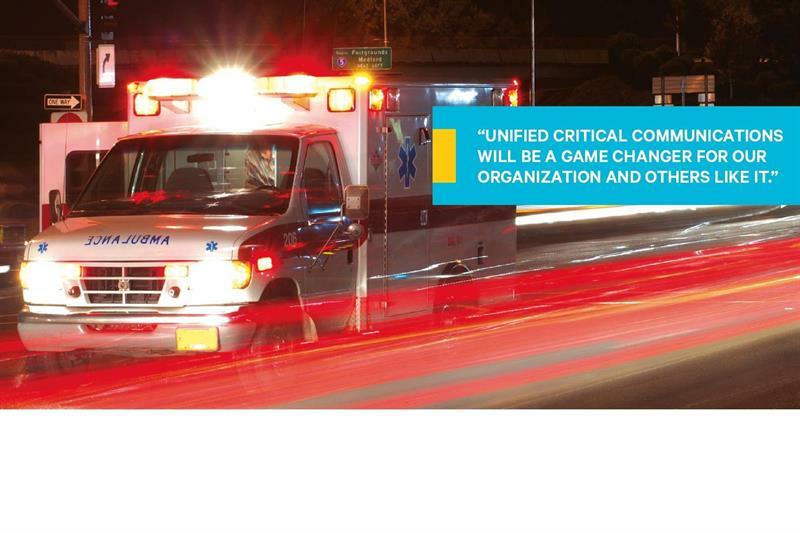 Unified Critical Communications will be a game changer for our organization and others like it. As Program Director for Health Infrastructure, I am an advocate of bringing the network with you. That means a WiFi bubble inside the vehicle, external links to the paramedic outside the vehicle, and also gives us a significantly smaller device footprint within the vehicle. 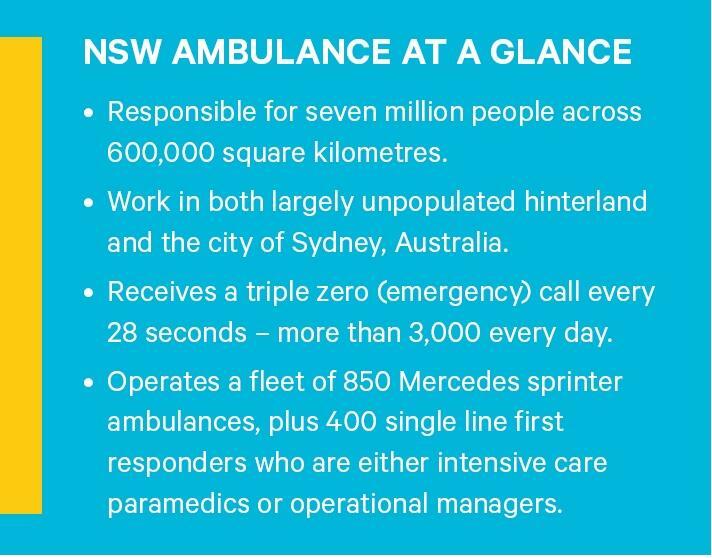 4G/5G, IoT and Big Data are already making these things possible, and NSW Ambulance is ready to invest. What we need is an experienced communications partner who we can feed raw data about what we want to achieve. They will develop the comms solutions that provide it. Experienced network operators are well aware of the associated costs and risks inherent in wholesale replacement of their communications network. Fortunately, UCC provides an effective alternative, as Ross Spearman, Chief Technical Officer at Tait Communications explains: “The future of comms … is really the convergence of voice and data over multiple bearers… to make that happen in a seamless way for the end user, so they don’t care what network they’re on: it just works”. This is ‘Unified Critical Communications’ (UCC) – an approach that is both radical, and deceptively simple. Deliver critical communications as a service to frontline personnel.